nothing to lose | pray. believe. conquer. Tomorrow I start on my second round of chemo (ICE). It has been a quick, crazy three weeks. So much has happened. The Friday after my chemo was the day I felt my worst. Once I made it through that rough weekend, I started to come around on Monday. Although I was feeling better, my immune system was at its lowest and got the best of me 7 days after my chemo. With peculiar fever and back pain that came on suddenly, I ended up at the ER from 8pm to 3am…there’s no such thing as a quick trip to the ER. Fortunately, it was nothing serious: just your average case of getting sick with a weak immune system. After a couple of days of antibiotics, I was feeling much better and decided I couldn’t stand to be away from North Carolina any longer. So with my immune system back up, I went to Boone for a few days to spend time with my fiance, friends and my oldest sister, nephew, and niece who drove there from Virginia. I had a great time, and I’m glad I made the trip because I’m not really sure when I will be able to go back. Just about the time I could say I felt almost completely normal again, the strands of hair that came out in my hands were a disturbing reminder of the reality I was trying to forget. Last time it took months. This time it took days. 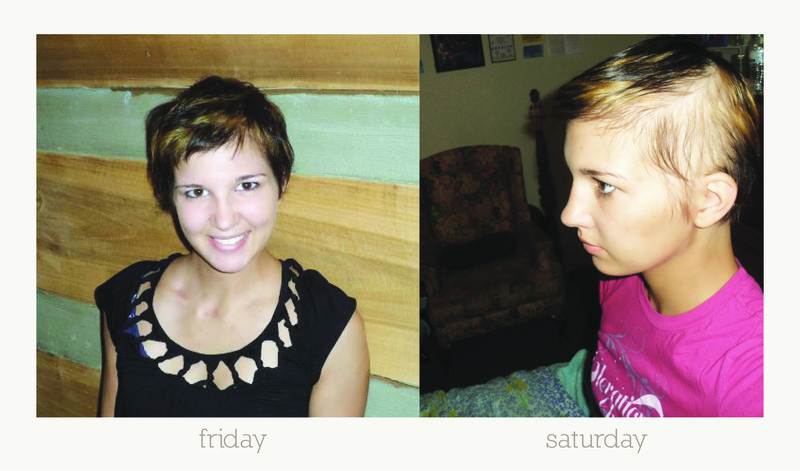 You can see from these pictures how fast my hair was coming out this weekend. In a way, it helped me to have those horrendous blonde streaks in my hair because it made me want to get rid of them faster. Since there wasn’t much left anyway, and it was to the point of just annoying me, I shaved my head clean today. I’m feeling great right now. I start my second round of chemo tomorrow. I lost my hair just within the past 4 days or so. Not gonna lie, I’m gonna miss my hair, but there are much worse things you could lose than your hair. I thank God for continuing to bless me through my treatments with good health and peace about what I’m going through. Meaness, you are just as beautiful without hair! Love you so much! Just know that I pray for you each and every day–many times, every time you come to mind, and God seems to bring you to mind often. And God is faithful! and we love you so much! Stay stong cousin! Keep up the good Fight- sending love from all the family up north. Now go whip it! We love you! Toughness is in the soul and spirit, not in muscles! Love you, Cheslie! You are a bright spot to so many people (including me). Love you and still praying for you. Praying for you daily! Praying the lord will give you strength and comfort during this round of treatment!! Wishing you many blessings today and every day! Cheslie, you’ve touched my heart tonight. Thank you for your blog…I’m your newest subscriber! I am praying for you and I know God has you as part of his brilliant master plan for all his precious children. Love you Cheslie! You are beautiful!!!!!! Thank you for being an inspiration throughout your whole journey. I heard your story as a friend of a friend — please know the word is out there and you are reaching people far and wide!!!! God bless you and keep you!!!! I am so touched by your strength through everything!